Follow in the footsteps of Professor Robert Langdon and special agent Sophie Neveu as they try to crack the mystery of the Da Vinci Code in London. A web of secret puzzles and hidden codes, and an enigma that could unravel the very basis of society, The Da Vinci Code rebooted the modern mystery novel genre and inspired a whole generation into reading once more. Since its publication in 2003 Dan Brown's novel has sold 80 million copies worldwide - outdone only by Harry Potter and the Order of the Phoenix. The book - which was nevertheless panned by the critics - has even spawned its own sub-genre of copycat crypto-religious 'literature'. Besides fame, the novel has also gained notoriety for its assertions about the life of Jesus and the Catholic Church, its inauspicious depiction of the sect Opus Dei, and the high profile court case involving two historians who claimed Brown had ripped off their research. With copies still flying off the shelves on the back of a big budget Hollywood adaptation, hordes of fans are eager to visit the locations they've read about and relive the tale. The latter half of the book all takes place in the UK, with the most exciting scenes in London itself. As well as seeing the settings for real, prospective sleuths can also take a number of tours with guides revealing the facts behind the fiction. 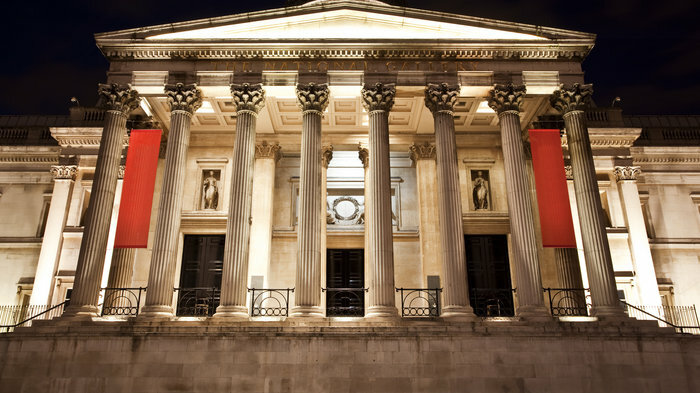 Da Vinci painted two versions of the work - the second hangs in the National Gallery on Trafalgar Square in London. Langdon says that this is a second "watered-down" version of the original, supposedly offensive to the Catholic Church. Take a look for yourself and see what you make of it. There's not much to see at Biggin Hill, but from here you can take flying lessons or an incredible helicopter ride over London. Nearby there are a host of historic properties to visit, including the former residences of Darwin and Churchill. After escaping from the police at Biggin Hill, Langdon and Neveu speed towards Fleet Street in Teabing's limousine in search of a knight's tomb they believe to contain the Holy Grail. They think the crypt is located in Temple Church, in the grounds of the Inner Temple - one of London's great medieval Inns of Court. Sandwiched between the Thames and Fleet Street, the Inner Temple's church and gardens are open for visitors. Built in the 12th century by the Knights Templar - a congregation of warrior priests who were sworn to protect pilgrims on their way to and from Jerusalem - the building is unusual for its original round layout, rather than the customary cross (the chancel was added later). It was built in the image of the Holy Sepulchre in Jerusalem - the destination of pilgrims in the Holy Land. The novel suggests that crusaders discovered evidence of descendants of Jesus after they conquered Jerusalem in 1099, setting up the Knights Templar to guard the secret. On the floor of the round part of the church lie the effigies of ten knights, which are heroes erroneously believe to be tombs. With the keystone and Teabing in Rémy's clutches, Robert and Sophie rush from Temple Church via Temple Underground station (on the Circle & District lines) to the King's College Library. They are in a race against time to unravel the clue from the cryptex, so they can catch up with their rival and save Teabing. The library is not actually adjacent to Parliament as described in the book (Westminster is about a mile further upstream). The King's campus found on the opposite bank of the Thames is, in fact, the Faculty of Medicine. The room depicted is actually the Reading Room of the Maughan Library on Chancery Lane, just a short walk from Temple Church. It is octagonal with a round table in the middle just as described. However, the University aren't keen on visitors without library cards! Throughout the tale, Silas and Rémy have been receiving phone calls from a shadowy figure known only as 'the Teacher'. While our hero and heroine are furiously trying to uncover the location of the Knight's tomb, the mysterious mastermind has lured Rémy, one of his pawns, to Horse Guards Parade next to St James's Park. He poisons him, thus eliminating the only person who knows his true identity. The area is famed as the venue for Trooping the Colour and Beating Retreat - two centuries-old military pageants - and, more recently, the London 2012 Olympic Beach Volleyball competition. Behind it, St James's Park is home to a fascinating menagerie of birdlife and some classic views of London. Under the malevolent influence of 'the Teacher', Silas - the murderous albino monk portrayed by Paul Bettany in the film adaptation of the book - seeks refuge in the London headquarters of the secretive Opus Dei. With the police closing in on him, he flees and in his delirium shoots his scheming mentor Bishop Aringarosa. The minority Catholic sect is very unhappy about their depiction in the novel. The hard-line, traditionalist group are keen to keep a low profile; membership is by invitation only. They have been criticised as the Catholic equivalent of the Freemasons, and despite the recent canonisation of founder Jose Maria Escriva, their close links to the Franco regime in Spain have not been forgotten. Former education secretary Ruth Kelly is reputedly a member. The novel has actually given the organisation massive publicity with record hits on their website since it was published. One of their buildings in London is indeed situated on Orme Court, opposite Kensington Gardens, exactly as described in the novel. Westminster Abbey does not welcome 'Da Vinci Code' tours, so you'll have to follow that last part of the London trail alone with the help of a few pointers from us. When Langdon and Sophie finally crack the code they realise that the knight they seek is, in fact, Sir Isaac Newton. They speed to Westminster Abbey where they know they will find his grave. They quickly locate the tomb of the great scientist Sir Isaac Newton on the north side of the nave. The tomb is exactly as described in the novel: Newton is reclining regally in classical robes atop a huge black marble sarcophagus, leaning on a pile of his works. There is a pyramid behind, on which there is a celestial globe depicting the signs of the zodiac. While examining the monument for clues - they discover a note from 'the Teacher'. It instructs them to follow him into the Chapter House and out into the public garden where he has Teabing captive. Langdon and Neveu rather foolishly take the Teacher at his word, following the evil mastermind into a dead end. Here, in a tense showdown, the identity of their adversary is finally revealed. The walls of the octagonal Chapter House are covered with murals of the Final Judgement. Ornate tile work and original Victorian stained glass adorn the area. It was here that King Henry III's Great Council convened for the first time in 1257 - the beginning of English Parliament. The Chapter House was used by the House of Commons until the 14th century, when they moved to the Palace of Westminster where they've sat ever since. This is the end of the London leg of 'The Da Vinci' tour. If you want to continue the journey on to its next stage in Edinburgh, why not opt for a tailor-made day trip by rail? Book tickets for an Edinburgh day trip here. In the meantime, happy sleuthing! From cheap budget places to stay to luxury 5 star hotels see our deals for hotels, including Grange White Hall Hotel London from 57% off.